Avallon is situated in central France in the region of Burgundy and the department of Yonne. Everyone is familiar with the name Burgundy, because of the very fine wines for which the area is justly acclaimed, but the lovely towns and villages of the region are much less well known. Avallon is one such town. Perched as it is, on top of a hill with views over the beautiful Parc Naturel Régional, this charming walled town deserves wider recognition. The streets are wide and attractive, and there are several buildings of architectural interest. There is a 12th century church with Romanesque sculptures to be visited, and the 11th century 'Tour de l' Horloge' tower which contains a museum. The town carries a unique atmosphere due in no small part to its rich and fascinating history. In the town, in the Place Vauban, there stands a monument in honour of Le Marachèl de Vauban, who was one of the greatest military engineers of history. He lived in the time of Louis X1V, and was responsible for planning defensive structures such as the town fortifications around Avallon itself. Visitors to Avallon cannot help but be struck by the glorious countryside surrounding the town. Take a walk in the Parc Naturel Régional, or follow the course of the River Cousin and cool your feet in its clear waters. Although there is no major international airport near Avallon, there are several airlines that fly from the UK to Lyon. Air France, British Airways, bmibaby, easyJet and bmi operate from various airports in the UK, so there should be something to please everyone! Lyon is around two hours travelling time from Avallon. For those who prefer to see France as they travel, the Autoroute 6 which heads south-east from Paris will get you to Avallon without difficulty. Rail travel is another option, as Avallon is on a branch of the main Paris-Lyon rail line. 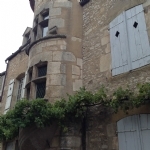 Property around Avallon can be a real bargain, particularly for those who are looking for a renovation project. In many areas of France there have been so many foreign buyers seeking these properties that there are hardly any left to be found, but this is not the case in this lovely region. Prices have been kept down by the lack of a nearby airport, but for those who can overlook this the town represents a chance to own a beautiful property at a really low price. Do you know Avallon better than we do? Do you have photos of Avallon? Avallon is in central France, to the north-west of Burgundy. Avallon lies in the heart of the region, south-east of the town of Auxerre. Access: By air: Air France, British Airways, bmibaby, easyJet and bmi fly to Lyon from various UK airports. By rail: The town is sited on a branch of the Paris-Lyon railway. By car: Head south-east from Paris through Bur on Autoroute 6. Economy: The economy is varied, but the town is known for its biscuits and gingerbread, wine, leather goods, wood and agriculture. Interesting fact: The church of Saint Lazare in Avallon had to be enlarged in order to accommodate the great numbers of pilgrims who came to see a piece of a skull kept in the church. This was believed to have come from the skull of Saint Lazare himself.